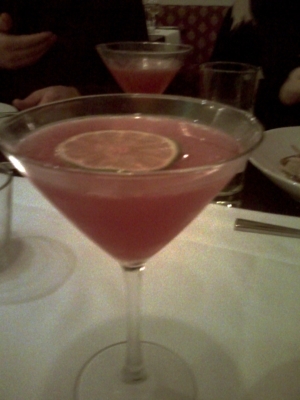 This drink is a pretty straight cosmopolitan except for a splash of pomegranate juice added to the vodka, Cointreau, and lime juice. It’s way stronger in flavor than a cosmo should be, meaning they probably added more than the advertised splash of everything but the vodka. I’m not complaining: it tastes great! There is a lot of orange and lime to catch my taste buds’ attention—almost too much lime. The citrus would be too bright for a second helping but as a standalone drink? Divine.